Spain as a nation is lottery mad! It is not uncommon to see a long queue of people outside a state-run lottery kiosk, where various forms of lottery ticket can be purchased. You may even find yourself approached in the street or in bars by people selling tickets. But it’s at Christmas that their enthusiasm really does go overboard. 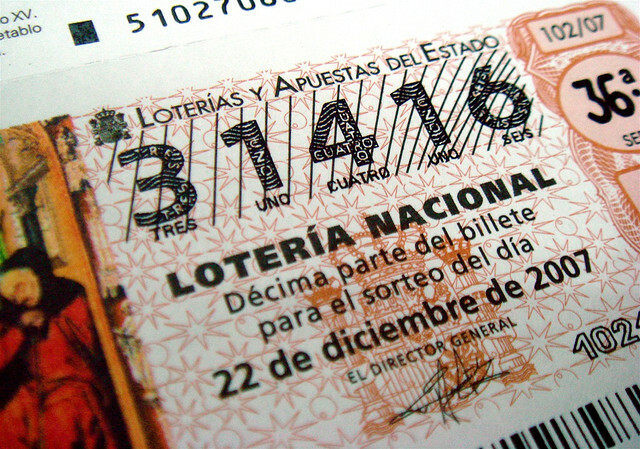 It was estimated last year that 98% of all Spanish adults participated in El Gordo (literal translation “The Fat One”), meaning that the Spanish Christmas lottery has the biggest prize pool of any lottery in the world, last year totaling over two and a half billion euros! Tickets are very expensive, around €200 each, but you don’t have to buy a whole ticket. Most tickets are sold in decimos, or tenths, and often groups of neighbours or families will club together to buy a ticket between them. This type of communal gambling can mean that whole villages or groups of workers can suddenly become very wealthy. El Gordo is drawn only once a year, on December 22nd, with the process taking in excess of four hours. The draw procedure has followed exactly the same form for over 100 years, with the pupils of the San Ildefonso school (formerly reserved for orphans of public servants) drawing the numbers and corresponding prizes, and singing the results aloud in front of the public. Believe it or not, people sit by their televisions or radios for much of the day, watching or listening to the live broadcast, eagerly awaiting the results. In the video, the boy is singing “one thousand euros“, which is the prize for that particular number drawn – and the girl sings the winning numbers which will each have that prize of one thousand euros. To be honest, it’s not the most riveting TV show …. unless they happen to draw your number, of course! The chances of winning a prize in the Spanish Christmas lottery are around 1:6, though not every one wins a fortune. Those who manage to win back their initial stake tend to spend it by buying a ticket for El Niño, the second largest draw of the year, which takes place on January 6th. Do you ever buy lottery tickets and, more importantly, have you ever won? This entry was tagged culture, customs, Europe, life, lottery, Spain. Bookmark the permalink. One year I was watching that exciting TV programme and I realized, it had no excitement for me because I hadn’t bought a lottery ticket, so there was no chance I could win anything. In order to remedy that, the next year I bought a ticket. That TV show became a lot more exciting then. And I won a pedrea and the reintegro! Never won anything ever again though. Aaaah the Spanish Christmas lottery. Your explanation of how it works has made the most sense… but it still seems really confusing, what with the fact many people get together to buy tenths of a lottery ticket. I agree Amelie – it does seem an odd way of doing it … but there were are! I saw on TV that 10 people (sharing one 200 euro ticket) won 1.8 billion between them. SHEESH!! it is a funny old way of drawing the lottery isn’t it, but every year my heart does a little flutter just hoping they’ll call my number! two and a half billion euros, wow!!! Merry Christmas and Happy 2014, Marianne! Incredible amount of money, isn’t it? No, I don’t play this lottery, Sue. All the very, very best of the holiday season to you and yours! Looking forward to our 2014 Blogging adventures! Merry Christmas!!! I buy my lottery tickets every week. We have the National draw on a Wednesday and Saturday with the Eurolottery draw on a Tuesday and a Friday. I once won £140 on the National and recently had £80 on the Euro but any win other than that has generally been £10 or less. It doesn’t end the hope of a big win and he incessant planning about how it would be spent as I try to go to sleep at night.The Euro is the best prize and is currently running at about £60m for next Tuesday after the fourth or fifth rollover.It has reached about £160m in the past.